An exciting aspect of working in the Amtrak Archives is the phone calls and emails we receive from readers and visitors to this website. Their insights often help us better understand and categorize pieces in our collection. Occasionally, we hear from persons interested in donating items ranging from slides to pamphlets to even a uniform. These donations not only help round out our collection, but also demonstrate the public’s interest in America’s Railroad. As a sign of appreciation, when adding an item to the website, we always include the donor’s name in the object description unless he or she asks to remain anonymous. Below we highlight recent additions to the archives. Old Amtrak service pins feature the first service mark. Cleaning out a storage room in Seattle, Amtrak employee Paula Cullinane found a set of pins that the company created to mark employees’ five, 10 and 25 year anniversaries. Amtrak distributed the first five-year service awards in 1977 to approximately 250 people. Intended as a lapel pin, it also came with a small chain so men could use it as a tie tack. 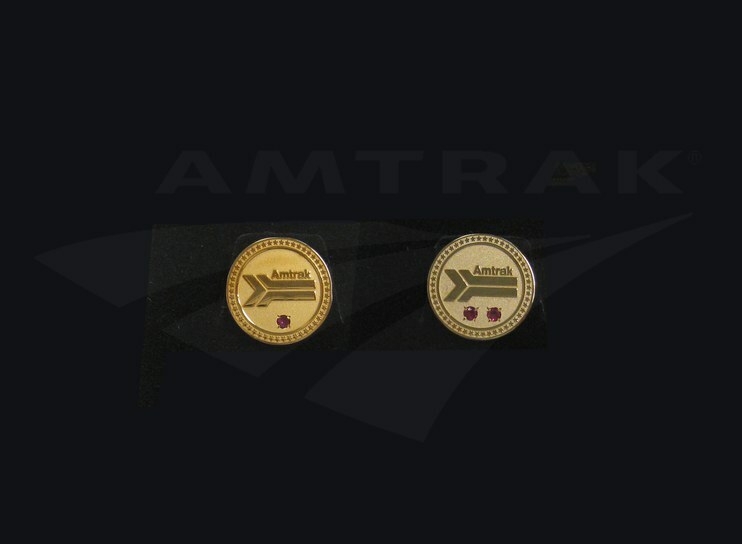 Made of antique gold, it features the first Amtrak service mark with a small ruby set below to denote five years. Two rubies thus denote ten years of service. Then-Amtrak President and CEO Paul Reistrup presents five year service awards to the company's first two employees. The photo above shows then-Amtrak President and CEO Paul Reistrup presenting the first service awards to two of the company's most senior employees, both of whom started working at Amtrak before it took over operation of the nation's intercity passenger rail network on May 1, 1971. 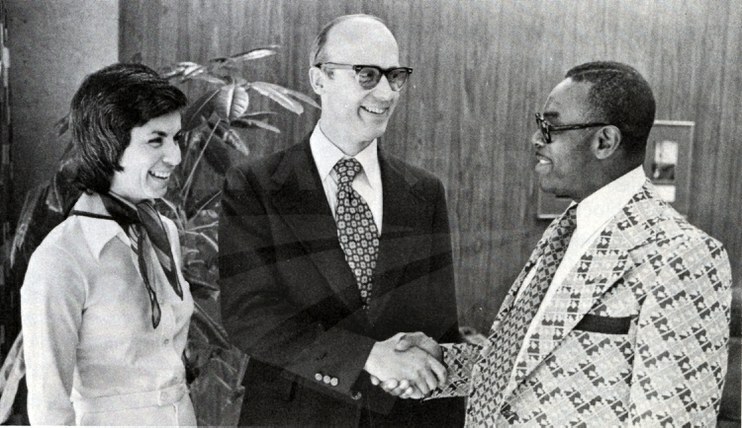 To the left of Reistrup (center) is Beverly Balanda, who became the first official Amtrak employee on February 22, 1971, as executive secretary to the incorporators of the company. To the right is Isaac Battle, who started working for Amtrak on March 1, 1971, as chauffeur to the incorporators. 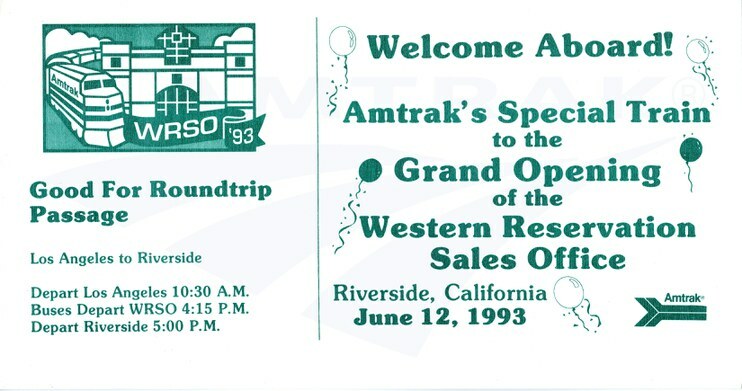 For the June 1993 dedication of the new Western Reservation Sales Office (now known as the Western Reservations Call Center (WRCC)) in Riverside, Calif., Amtrak ran a special train from Los Angeles for employees. This commemorative ticket, donated by longtime Amtrak employee Gerald Powell, features a stylized image of the building with a train; a matching pin was also distributed. Commemorative ticket marking the inauguration of the Western Reservation Sales Office. The WRCC was established in 1971 in Seattle, Wash.; it later moved to San Francisco and then Los Angeles where it remained for almost two decades. Due to the high costs of leasing office space in Los Angeles, the Amtrak Board of Directors approved capital funds in 1990 for the purchase of land and construction of a call center. Amtrak chose Riverside after a nationwide search, and the new facility was officially dedicated on June 12, 1993. Agents received the first call the next day. As of 2013, the WRCC is open 20.5 hours a day. Between it and the Mid-Atlantic Reservations Contact Center outside of Philadelphia, Amtrak can answer customer questions and take reservations for train travel 24 hours a day, 365 days of the year. In fiscal year 2013, the contact centers handled approximately 7.3 million calls. Riverside staff can also respond to requests related to group and travel agency bookings, as well as the Amtrak Guest Rewards customer loyalty program. The X2000 undergoes testing along the Keystone Corridor in Lancaster County, Pa. Earlier this year, we received an email from Ingwar Afeldt, who as an employee of Swedish State Railways, was sent to the United States in 1992-1993 to instruct Amtrak Road Foremen and Engineers on the operation of the high-speed X2000 train. Afeldt had been among a small group of Road Foremen selected to train and test the new X2000 in Sweden, where it debuted in revenue service in September 1990. At the time, Amtrak was exploring the development of high-speed rail and leased two European trainsets for testing: the X2000 and the German Inter City Express (ICE). Both trainsets were used in revenue service on the Northeast Corridor in 1993, and they would later inform the design of the Acela Express equipment. The trainsets were also put on display in cities across the country. Afeldt generously donated 82 images he took during the X2000 national tour, as well as related memorabilia. Designed and built by Asea Brown Boveri, Inc. for the Swedish State Railways, the X2000 shown above was tested by Amtrak because it could travel at higher speeds than conventional trains on existing main line track. Here the X2000 makes test runs at Leaman Place, Pa., in December 1992. 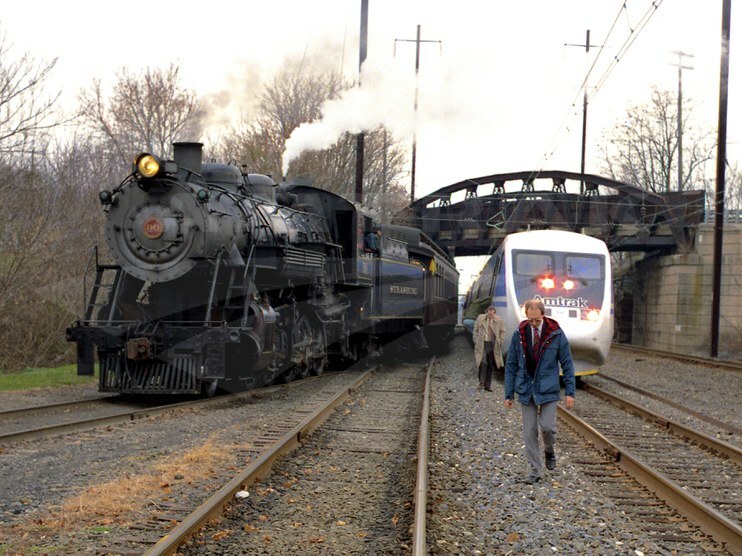 Located between the Amtrak stations at Lancaster and Parkesburg, Leaman Place is where the heritage Strasburg Rail Road connects with the Keystone Corridor—thus the pairing of the steam locomotive with the modern, electric, high-speed X2000. Check out more of Afeldt’s tour photos (and keep an eye out for others to be posted in the future). A cachet on this envelope marks the 30th anniversary of the Lake Shore Limited. The last item came to the archives via the 2014 National Train Day celebration held in Toledo, Ohio. Bill Gill, Chairman of the Toledo National Train Day Committee, donated this envelope, which includes a cachet on the cover with an image of an Amtrak P-42 locomotive in the Phase III paint scheme. The decorative cachet, along with the railroad-themed stamps, were made to celebrate the 30th anniversary of the modern Lake Shore Limited (New York/Boston-Chicago), which began operation on October 31, 1975 (note that the cancellation stamp is for October 31, 2005). The stamp labeled “Ohio for Passenger Rail” is an example of what stamp collectors call a “Cinderella stamp,” meaning that it has no postal use and is merely decorative and educational.